In the past, when people came from out of state to sample Utah’s local beers, they seemed to expect a weak, unflavored drink. Steve Kirkland, brewmaster at Roosters, has seen that perception change. Now instead of worrying about the 3.2 alcohol content they enjoy the full flavor and full body offered in today’s craft beers. Branching out, Roosters recently began bottling high point beers to be sold in other venues. They are starting with three brews; Argo/ESB which stands for extra special bitter, Peloton Pale Ale and Niner Bock. The Niner Bock is a double bock style with 9% alcohol content. Available since the end of December Steve has high hopes for the new line. Because he is too busy brewing 700 barrels a year, Kirkland doesn’t enter many brewing contests–although he won a stout contest last year at the Lander Brew Fest in Lander, Wyoming with their Junction City Chocolate Stout. 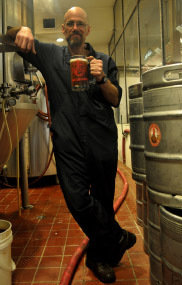 Steve is happy being a brewmaster in Utah but would change a couple of things if he suddenly found himself governor of Utah. The first thing he would change is the law saying that only two glasses of an alcoholic beverage can be in front of someone at a restaurant table. The law doesn’t take into account glass size and he finds it silly that someone can have two huge glasses of beer in front of them, but can’t be offered a tiny sampler size of more than two brews. He’d also like to change the keg law and make it legal to buy a keg. He said people still get the same amount of beer for a party – they just have to do it by buying more containers.